One hot, dry afternoon, Otis the Tractor spots something moving down in the valley-an orange tabby cat headed for the old barn. But than Otis sees something else that causes him to sputter....a swirl of smoke coming from the same barn. A fire! As Otis races toward the barn with his friends, he spots the cat mewling in alarm. What could she be trying to tell him? Otis rushes inside, putt puff puttedy chuff- and up in the hayloft he spots kittens! As Otis tries to rescue the kittens the fire gets worse. Now who will rescue Otis as barn floor collapses. This is a story for young adults that will show courage. How a tractor named Otis saves kittens only to be caught in barn basement as barn floor collapses under his tractor frame. It is a testament to fire fighters and animals who would not let the tractor Otis die in massive barn fire. It shows an clear sense of emotion towards tractor Otis. His ability to react to kittens caught in barn fire resonated in being hero. He did rescue all kittens and Mother tabby. Many fire fighters than helped rescue Otis from fire that had engulfed barn. There was also new home given for orange tabby and kittens. 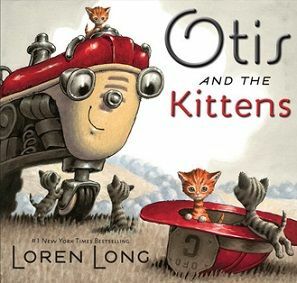 Otis and the Kittens is one of series of books wrote about Otis the tractor. I am next going to read "Otis and the Scarecrow". I think Loren Long is also illustrator of book. I could not find mention of illustrator.